Jobs Growth Sputtered In May, Report Signals : The Two-Way There was only a 38,000 increase in employment in May from April, according to the latest ADP National Employment Report — a widely watched indicator of labor market strength and a prelude to Friday's May jobs report from the Labor Department. 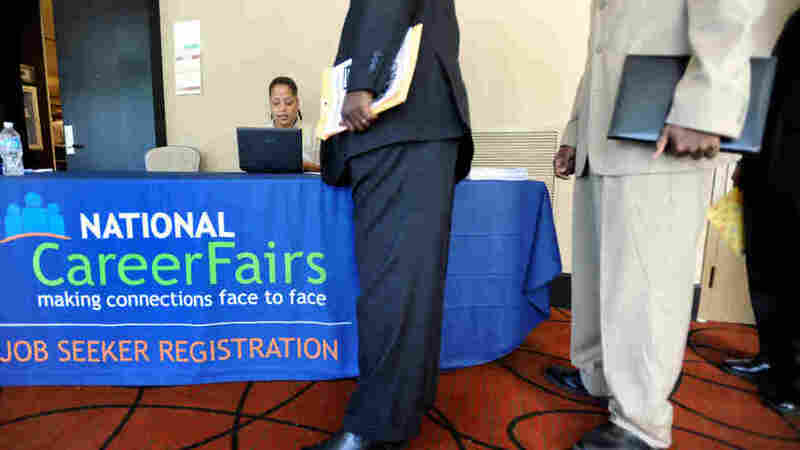 The line at a job fair last month in Linthicum, Md. There was only a 38,000-increase in employment in May from April, according to the latest ADP National Employment Report — a widely watched indicator of labor market strength and something of a prelude to Friday's May jobs report from the Labor Department. -- "Employment in the service-providing sector rose by 48,000, marking 17 consecutive months of employment gains while employment in the goods-producing sector fell 10,000 following six months of increases." -- "Employment among large businesses, defined as those with 500 or more workers, decreased by 19,000, while employment among medium-size businesses, defined as those with between 50 and 499 workers, increased by 30,000. Employment for small businesses, defined as those with fewer than 50 workers, rose 27,000 in May." Our friends at Planet Money make sense of the economic news here.